Leroy Setziol, Untitled, 1991. Teak. Collection of Carole Smith and Eric Kittleson. A composer in wood, Leroy Setziol created lyrical sculpture that honors the beauty of a material strongly identified with the Northwest. The black walnut, teak, fir, and other woods he employed enhanced his complex gridded compositions, bringing them to life. A self-taught, intuitive worker, Setziol visualized his complex carvings using the grid as an armature to frame imaginative shapes. Throughout his career, his sculpture ranged from intimate works to large-scale public commissions. The largest work on display is an elegant, teak, two-panel wall relief from 1991. Twenty-three works are on view, including free-standing sculpture, totems, and a variety of wall reliefs. 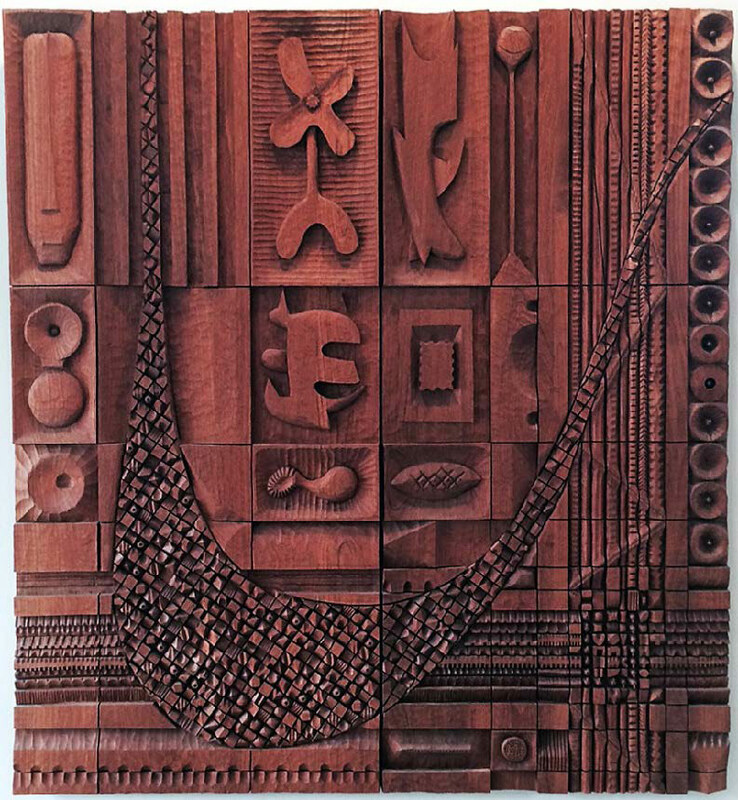 Setziol’s sculpture gained greater recognition with Portland’s architectural community in 1964 when he was invited by Northwest Regionalist architect John Storrs to carve a series of large-scale relief panels for Salishan Lodge in Gleneden Beach, Oregon. Recognized for the commission’s fine quality and compatibility with Modernist architecture, Setziol subsequently was invited by many of Oregon’s leading architects to collaborate on commissioned projects. His work has been exhibited widely around the Northwest, and Setziol received several awards during his lifetime, notably the Portland AIA Artist of the Year Award and the Oregon Governor’s Award for the Arts. Exhibition organized in honor of the 100th year of Leroy Setziol’s birth and curated by Bonnie Laing-Malcolmson, The Arlene and Harold Schnitzer Curator of Northwest Art.